A new Orlando bowl game will benefit the fight to defeat breast cancer and the work of an innovative UCF College of Medicine researcher. 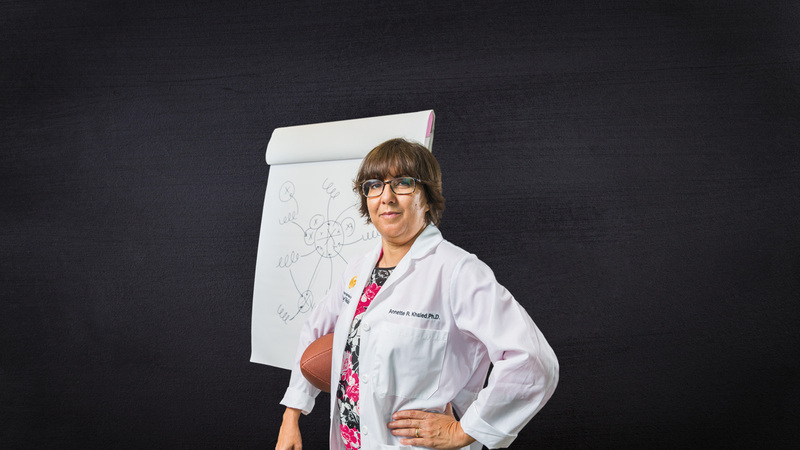 When college football fans converge for the inaugural AutoNation Cure Bowl at the Orlando Citrus Bowl Dec. 19, they will not only be supporting their favorite NCAA team but also the breast cancer research of Dr. Annette Khaled. The Burnett School of Biomedical Sciences associate professor is the latest recipient — and only the fifth in Florida — to be awarded a $250,000 grant from the Breast Cancer Research Foundation (BCRF), which will receive the net proceeds from the new postseason game. The grant funds her work developing new technologies to treat metastatic cancer cells, research that Myra Biblowit, BCRF president and CEO, describes as seminal. Khaled’s lab has discovered that metastatic cancer cells contain a high level of the protein chaperonin-containing T-complex, or CCT. The faster the cancer cells spread, the sicker they make patients and the more CCT they contain. Through this grant, Khaled’s team is identifying drug therapies that can seek out these cells and kill them. Florida Hospital, which is a corporate sponsor of the bowl, provides tissue samples from breast cancer patients so Khaled can develop individualized treatments based on the type of cancer. “Research is one of our strongest weapons in the fight against breast cancer, and Florida Hospital is proud to be part of an exciting bowl game that will raise awareness both locally and nationally, and raise funds for research,” says Dr. Lori Boardman, medical director of Florida Hospital for Women and a faculty member at the UCF College of Medicine. More than 200,000 women will be diagnosed with invasive breast cancer this year, according to the American Cancer Society. According to Biblowit, her organization has raised $530 million so far and awarded $58 million to 237 cancer researchers across six continents. The foundation has donated $1.25 million to Florida researchers that Biblowit describes as “eminent cancer scholars.” Three of the donations have gone to the University of Miami, one to Mayo Clinic in Jacksonville and the latest to the UCF College of Medicine’s Khaled. The BCRF has received an A+ rating from CharityWatch and spends 91 cents of every $1 it receives on breast cancer research. The group plans to disburse $58.6 million this year with help from the AutoNation Cure Bowl. While most NCAA bowl games make contributions to charity, few include the name of their cause in their title. The Orlando Sports Foundation (OSF), the nonprofit organizer of the AutoNation Cure Bowl, is dedicated to raising funds and awareness for organizations working to find a cure for cancer, says OSF Executive Director Alan Gooch, ’84, who was a football coach at UCF from 1983 to 2003. OSF will support the BCRF through a minimum $150,000 donation raised by the game, but they hope to present a check for even more. The AutoNation Cure Bowl, which will include a “Cure Village” at the stadium where fans can receive mammograms and other screenings on game day, will match teams from the Sun Belt Conference and the American Athletic Conference. The game will be televised on CBS Sports Network.